Visit Fort William/An Gearasdan Highland and the surrounding villages and stay in b and b, hotel or holiday cottage accommodation provided by BedPosts members. Britain's highest mountain - Ben Nevis is 7 miles distant - is Fort William's greatest asset. The town is also at the southern entrance to the Great Glen and at the head of Loch Linnhe, with routes to Badenoch and Skye.But don't head off just yet. There are more delights closer by. The West Highland Museum exhibits the Jacobite collections, natural history, Highland clothing and crofting. Treasures of the Earth, at Corpach to the west of town, is a huge collection of rare gemstones, crystals and fossils, including Europe's largest uncut emerald. Discover how amethyst crystals take a quarter of a million years to grow just 1 inch. Take a breathtaking trip on Nevis Range Mountain Cable Car. Panoramic vistas to the upper slopes of Aonach Mor [4,000 ft] open up from enclosed gondola cable cars which cover about 1.5 miles in their climb to an altitude of 2,150 feet. The ascent takes about 15 minutes and at the top, in addition to the breathtaking views across Loch Lochy, the Great Glen, Loch Eil and the Inner Hebrides, you will find a restaurant, a sports shop, telescopes, interpretative plaques and slide presentations. Two recommended walks are to Sgurr Finnisg-aig [taking about 20 minutes each way] and to Meal Beag [taking about 30 minutes in each direction]. 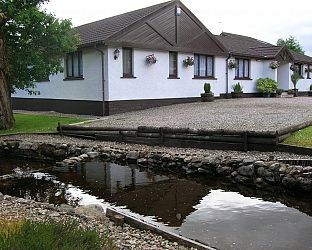 If you seek accommodation near Fort William/An Gearasdan in Highland you have come to the website of a “club” of providers who offer affordable quality accommodation around UK in hotels, bed and breakfasts, guesthouses, inns, and restaurants plus self-catering cottages and apartments .